Satellite TV at chair-side: Our chair-side satellite television is especially popular with our younger patients, who love watching cartoons during their appointments. Not surprisingly, we have found children to be more at ease during their visits since we introduced satellite TV at every chair-side. Experienced staff : Our staff is experienced in interacting with children – both clinically and outside the dental office. We understand that children are not simply smaller versions of adults, and recognize that they need to be treated in a way that respects both their physical and emotional differences. Prize Box : Kids are rewarded at the end of their dental visit with their choice of a prize from our prize box. 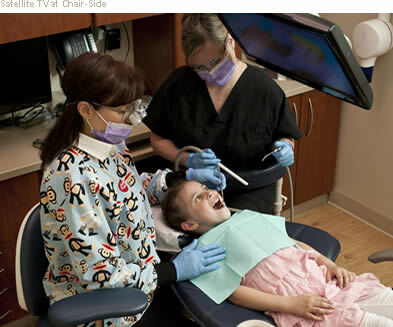 Sedation : Some children may be more anxious than others during their dental visits. We have several options available for sedation that are safe and effective for children.